Continuing the trend of identifying stocks that have limited or no market visibility but are attractive businesses at attractive prices I present Bioqual. Bioqual is a medical research company, their researchers are located in three facilities spanning over 130,000 sq ft. The company researches all sorts of infectious diseases, cancer they also take part in an activity they call animal modeling. To anyone not versed in medical speak 'animal modeling' means lab conducted medical tests, think lab mice. This probably isn't the prettiest business but someone has to do it if people want to continue taking pills for various ailments. The company scientists on staff that do proprietary and published research, the company also does contract research for the government groups such as the EPA, or universities. The company is awarded contracts that have a guaranteed minimum revenue and a maximum revenue per year. The company doesn't give much detail in what drives the differences in revenues but my guess is that it's a milestone based system. The client sets out certain milestones and goals they wish to achieve. Bioqual will begin tests and as certain phases are completed the client examines the results and determines if it's worth continuing further. If everything hits according to plan maximum revenue targets can be hit. Of course this is all speculation on my part, but based on the limited details the company has released this seems to be the case. I want to note the ranges are wild, for a contract mentioned in the 2010 annual report the minimum revenue is $47k and maximum is $25m. I wanted to highlight a few of the reasons the stock interested me first before diving into the weeds. This is the first question I ask myself when looking at a stock. For most of my pink sheet stocks the answer is found in the obscurity and illiquidity. I think those are two valid reasons for Bioqual's relative discount but there's a third reason. As for the first two the company doesn't file with the SEC so information can be hard to find although the company does publish audited financials on their website going back to 2009, and historic financials (pre-2002) can be found in EDGAR. Within the realm of illiquid small stocks Bioqual does trade fairly frequently. Looking back at trade history about 500 shares trade at least once a week, sometimes more. I know this seems like a puny amount but for a lot of these tiny stocks that's considered liquid. If someone soaked up all of the liquidity for a year they'd own about 3% of the company. I think the real reason the company is cheap is due to a contract change that has lead to revenue uncertainty. For years Bioqual was growing revenue at a steady pace, they only had a slight blip from 2008 going into 2009 and largely avoided the recession. That all changed in 2010, as I mentioned above the government in many capacities is one of their largest clients. The government changed the requirements of the contract process demanding an expert in all phases be available at all times. The problem with this is that experts always need to be available but can't always be billable. This means that overhead started to rise and at times it wasn't profitable to bid on contracts where in the past it would have been leading to a decline in revenue. The conclusion I draw from this is that there has been a structural shift for the company, one that isn't going away. In this light I think it's important to look at some of the past financials, but more emphasis should be placed on the more recent information. I also think it's silly to look at past EPS and hope for some sort of mean reversion. I first wanted to show my net-net worksheet. When I first found this stock they were trading below NCAV, but as with many microcaps 900 shares traded hands and the price jumped 13%. 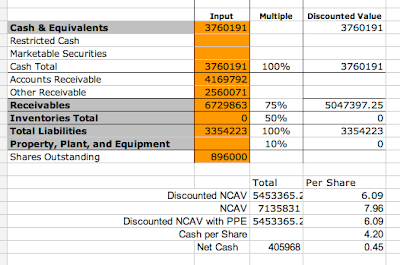 As recently as 12/21/2011 the company was trading below NCAV. As a tip, if anyone is interested in Bioqual I'd put in a bid in the $7s and let it sit, it wouldn't surprise me if it's filled in a week or two, these shares tend to be very volatile. The first thing that jumped out to me was the high cash balance, this has been a consistent factor for Bioqual through the years. I don't think a potential investor can count on a big special dividend paying it back, the company likes to run with a heavy cash balance. The second thing that popped out at me was that most of the rest of current assets was composed of receivables, and the company had no inventory. Having no inventory makes sense considering that Bioqual is a service company. The high receivables make sense considering the government is the biggest client and often there are numerous hoops to jump through to satisfy government billing meaning slow payments at times. I didn't put a PP&E number on my worksheet because the other assets on the balance sheet are leasehold improvements which I would peg in a liquidation to a very low value. Maybe Bioqual has some very fascinating equipment but I'm guessing in a fire sale the right buyer isn't likely to emerge, so this stuff would be going for scrap prices. The good news is the company isn't liquidating, quite the opposite they have a nice track record of profitability so the above mentioned assets can be considered essential for generating a return for the business. I went ahead and put together a nice spreadsheet for Bioqual that I've posted below. I added a column between each year showing YoY changes. I realized that by not including this column in the past I might have missed nuances in the data. If anyone is interested in the Excel copy of this file email me and I'll send it to you. 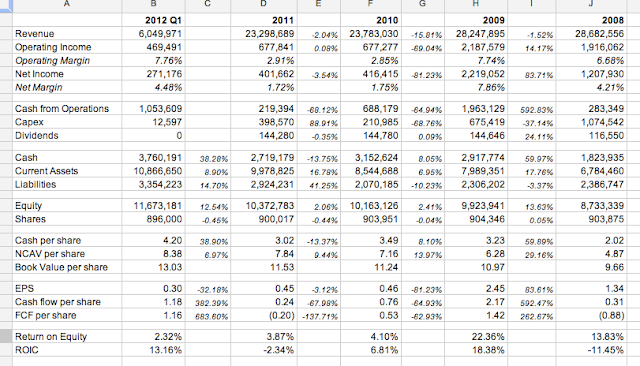 The revenue decline is pretty clear in the spreadsheet, I think it's safe to say things will probably stabilize close to the 2011 level. I also want to note that the company mentioned that capex for the 2012 year will total ~$87,000, a large decline from the previous years. This will in turn be a one time boost for free cash flow and could lead to a larger than normal year end dividend. 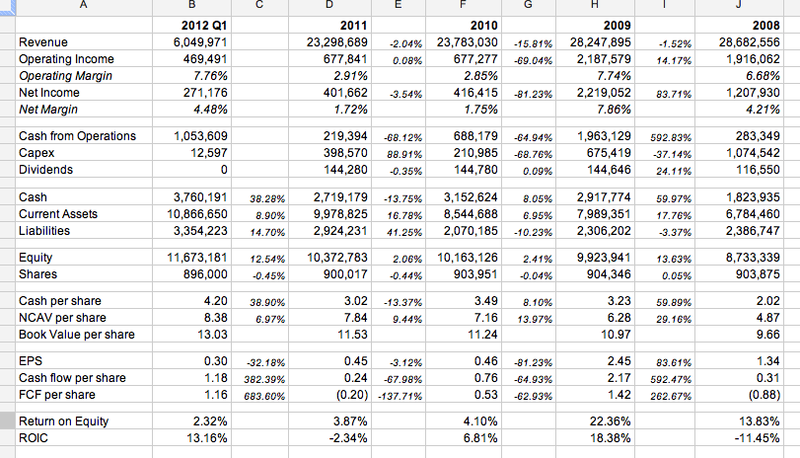 I don't feel like I have much else to say about the company since the spreadsheet contains so much data. This is a company that has a track record of a very volatile ROE and ROIC yet they are both mostly positive. The company has been increasing book value consistently since 2008. The cash balances have been increasing for the past few years, and the number of shares outstanding have been dropping. All of these things are great signs. Additionally a relatively modest amount of cash is returned to shareholders each year as dividends. For an investor who is worried about being "stuck" in Bioqual I can think of much worst stocks to be stuck in. Consider someone who buys today and can't sell for five years; in five years they'd own a slight bit more of a more valuable company, and would have received about 10% of their purchase returned as dividends. I think Bioqual is a great beginner net-net stock. There is a real margin of safety here in the liquidation value, yet at the same time value will be realized by the company's operations not some sort of asset liquidation. For someone who has never invested in a net-net there isn't as big of a leap of faith to put a few grand into Bioqual because the operations aren't that risky. The company's contracts are long term and they seem to have a high level of profit visibility at the management level. With all of this said it probably seems like the perfect stock and at this point you the reader are wondering how much of my money I have invested. The answer is none, I really like Bioqual, but there are much cheaper stocks on my radar. If anything I might put in a lowball bid at $7 or so for a small position but nothing more. While this has the potential for a nice return I don't think it's a dollar for fifty cents.